Let's get one thing straight: Most of the cast members of Rich Kids of Beverly Hills started out rich because their parents are. Although, after three seasons on E!, these young men and women born with silver spoons in their mouths are now making some money of their own. Still, the reason most of these twentysomethings made the cut to star in this reality series is because their parents did something to amass great wealth for themselves and their families. So, what did the RIch Kids' parents do to make their money? Don't get me wrong. There's certainly nothing wrong with family money. You can't help what family you're born into. Plus, it's not like the Rich Kids of Beverly Hills don't know that already, either. That is the basic premise for the series, after all. In order to better understand the Rich Kids of Beverly Hills — and I know that's exactly what you're aching to do — you've got to know where they came from. The parents of the Rich Kids of Beverly Hills have worked hard at their careers in sports, entertainment, and business just so their offspring could have better lives than they had. You've got to love parents, especially when they support your fabuluxe lifestyle no matter what the cost. Especially then. Take a look at how the parents of each of the Rich Kids of Beverly Hills cast members got to be so, well, rich. And, no, you can't be adopted by them. 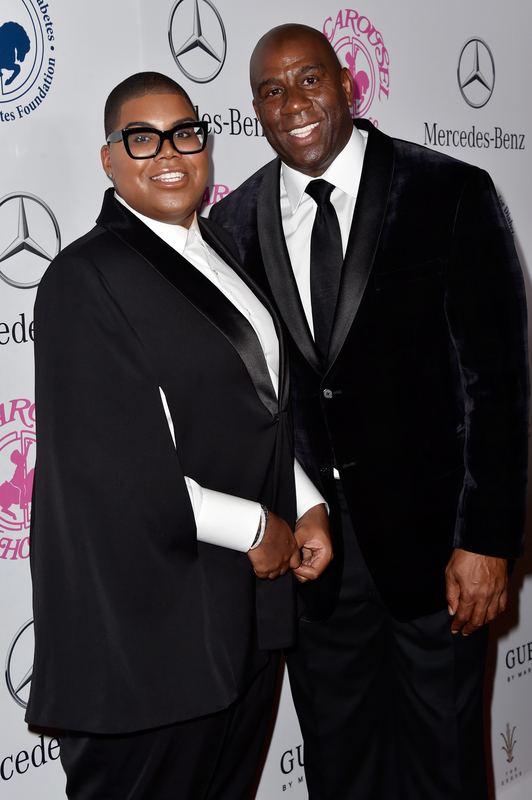 EJ Johnson's parents are by far the most famous out of any of the Rich Kids of Beverly Hills parents. EJ's dad is Earvin "Magic" Johnson, the former Los Angeles Lakers star who is widely considered one of the best basketball players of all time, having been inducted into the Basketball Hall of Fame in 2002. Just because Magic retired from the NBA in 1996 doesn't mean he's been chillaxing ever since then. Magic's career had a second act as he focused his attention on becoming a successful entrepreneur with Magic Johnson Enterprises, the company he founded in 1987. Through the years, the company has invested in a wide variety of companies, from movie theaters to restaurants to sports teams. Not to be outdone, in addition to serving as secretary of the board of directors of the Magic Johnson Foundation, EJ's mom Cookie Johnson also has a denim line called CJ by Cookie Johnson. It's easy to see which parent gave EJ his height, and which gave him his fashion sense. Dorothy Wang is the Rich Kid who is most eager to flaunt her wealth, and that's probably because her family has a whole lot of it. Dorothy's father Roger Wang is the chairman of Golden Eagle Retail Group Limited, which owns retail stores in 17 cities in China. That has given him a net worth of $3.8 billion, making him the 557th richest person in the world, according to Forbes' 2015 list of the world's billionaires. Dorothy's mother Vivine Wang has even been involved with her husband's business ventures. And now of course, we sometimes see Vivine on Rich Kids of Beverly Hills , which has to be a way more fun way for her to spend her time. Morgan Stewart may be one of the more free-spirited Rich Kids of Beverly Hills cast members, but her parents seem pretty practical and straight-laced in comparison. Her father, Herb Stewart, is a developer and builder with his own Beverly Hills-based firm, H Construct, Inc. Some of the projects Herb is responsible for include basically the who's who of Rodeo Drive (Gucci, Fendi, Louis Vuitton), and other high-end shops and restaurants around Beverly Hills. As for Morgan's mother, Susan Stewart, she "puts up with me on a daily basis," Morgan told E! News in 2014. We all know that's a full-time job. Though Morgan's fiance Brendan Fitzpatrick was born into wealth, he has been successfully supporting himself for a while as a broker for the luxury real estate firm, The Agency. It's unclear exactly what his parents do, but it doesn't look like that matters to Brendan much now that he's been making it on his own. Still, Brendan has looked to his parents for emotional support this season, like right before he proposed to Morgan. Roxy Sowlaty has followed her passion to start her own business since she was 16-years-old. That's probably because that ambition runs in the family. Roxy's father Sam Sowlaty runs the printing company Acuprint. Roxy's parents showed her some tough love on Rich Kids of Beverly Hills , famously cutting her off at the end of Season 1. Now that Roxy's interior design business has started to take off in Season 3, it looks like she's finally fully following in her father's footsteps. Clearly, Roxy got the message loud and clear. Like Brendan, Jonny comes from a privileged upbringing, but he doesn't like to call attention to it. "I’m very East Coast. We kind of go by the rule, 'If you have money, don’t talk about it,'" Jonny told The Backlot in 2013. "I’ve been out from under my parents’ wing for over two years. I’m working really hard to keep it that way. But I don’t really speak about it." As such, we don't know much about what Jonny's parents do for a living, but he'd probably like us to focus on his own singing career anyway. The other Rich Kids of Beverly Hills parents you probably knew before reading this article were David Hasselhoff and Pamela Bach-Hasselhoff, the father and mother of Taylor-Ann Hasselhoff. She does kind of look like them, no? Of course, you know the man, the myth, the legend David Hasselhoff, star of Knight Rider , Baywatch , and the upcoming Sharknado 3: Oh Hell No! , which may just be his most memorable role yet. I don't know. His cameo in The Spongebob Squarepants Movie is obviously a contender. Pamela Bach-Hasselhoff is an actress. She and David met on the set of Knight Rider and were married from 1989 to 2006 when they went through a bit of a nasty divorce. Pamela also starred in Baywatch, the '90s TV drama Sirens , and the U.K.'s Celebrity Big Brother in 2011. After all this, I've concluded that the lives of the Rich Kids of Beverly Hills parents are so entertaining, a spin-off starring them would be amazing, don't you think?